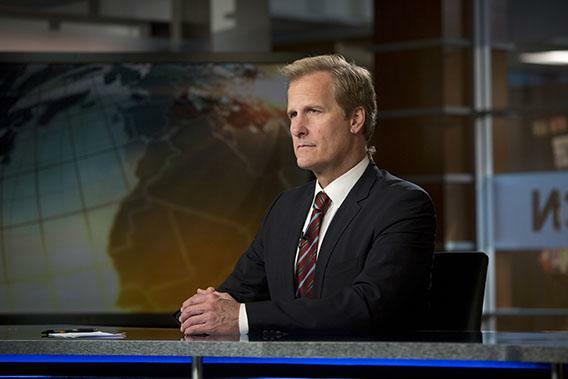 Season 2 of Aaron Sorkin’s The Newsroom on HBO, reviewed. The new season of Aaron Sorkin’s The Newsroom. The risible trailer for the second season of Aaron Sorkin’s The Newsroom, which begins Sunday night on HBO, had news anchor Will McAvoy (Jeff Daniels) wandering through the desert. Trudging past Joshua tress, vultures circling in the sky, McAvoy came upon his colleagues in various states of frustration: Sloan Sabbith (Olivia Munn) tossed a headset into the sand; Neal Sampat (Dev Patel) slammed a cellphone into the dirt; Mackenzie McHale (Emily Mortimer) nuzzled up to Will and then disappeared. As the music swelled—not Coldplay, but close—Will surmounted a slope only to see miles more desert laid out before him. He staggered toward a television set resting on the ground, his colleagues filing in behind him, all bathed in the machine’s eerie, flickering light. If one were hoping the new season of The Newsroom would be less pompous, smug, or self-satisfied than the last, here, even before it aired was the answer: You know who else wandered through the desert? The Newsroom premiered a year ago to extremely high expectations. Sorkin, HBO, a behind-the-scenes series set in a world far removed from sketch comedy—what could go wrong? But Newsroom gave Sorkin, already pedantic, unprecedented opportunities for hectoring and lecturing. Setting Newsroom in the near past, Sorkin used the fictional fast-talking spastics of the News Night team to “correct” for the real world’s broken cable news industry, showing the professionals how they should have handled everything from the Tea Party to the shooting of Gabrielle Giffords. Newsroom argued that if only America had a cable news program upon a hill like Will McAvoy’s—if only anyone really cared about the news, as opposed to ratings and entertainment—civility, intelligence and cooperation would be restored. Despite its glaring flaws—the music cues, the condescension, the essential assumption that everyone with whom Sorkin disagrees is an idiot—The Newsroom was often invigorating. It so boastfully claimed to have all the answers that to watch was to be dragged into a conversation with it, to groan, cheer, throw up one’s hands, shake one’s fist, pump one’s fist, cackle. It wasn’t good, but it could be visceral: manipulatively snaking into tear ducts, slamming home a point, getting under the skin. Since its premiere, the show has even become a kind of benchmark for major news events—as in, a news event is not major if hundreds of people do not sarcastically tweet about how they “can’t wait to see [X event] get the Newsroom treatment.” It may be mocked, but it is also front of mind. The second season of The Newsroom seeks to deflate some of the grandiosity of the first. You know the saying: If it is broke, please do try to fix it. Last year, the News Night team, with the benefit of hindsight and a speechwriter of Sorkin’s caliber, always got to be right. The entire second season, however, is concerned with an epic mistake: News Night is being sued for airing a story alleging that the U.S. government used poison gas on a civilian population. The first episode opens with Mackenzie being deposed—by a cheeky lawyer played by Marcia Gay Harden—and a series of depositions, and flashbacks out of those depositions, frame the season. The echo of the interrogative structure that worked so well for Sorkin in The Social Network can’t be accidental. Speechifying makes sense when you’re on trial. But outside the deposition room, in the News Night offices, everyone is as self-important as they ever were. The Catch-22 of The Newsroom is that though Aaron Sorkin, swaggering defender of intelligence and educated elites, does not, presumably, imagine his audience to be people who only get their news from The Newsroom, those are the only people for whom the show will feel fresh. If you get your news from anywhere other than The Newsroom, to watch the show is to be harangued by opinions you have heard many, many times over, just polished with Sorkin’s trademark linguistic flourishes and passed off as shiny and new. Here’s a brief rundown of bold perspectives grandly espoused by the show’s characters over the new season’s first four episodes: Cable news is tawdry and crass and broken; the cultural conversation is overrun with snark; Troy Davis was wrongfully executed; the way we cover political campaigns is stupid; Occupy Wall Street would have been more effective if it had a leader; Africa is dangerous and it’s complicated when Americans, especially white Americans, go there to try and help. All of these “ideas” are rendered as though the characters on The Newsroom were the first to ever have had them. (Coming soon, the News Night team discovers that poverty is a thing and it’s fun to twist Oreo cookies apart before you eat them!) Sorkin brings an entire episode to a halt so that Don (Thomas Sadoski) can deliver a speech about Davis’ execution. It’s so didactic that you would be forgiven for thinking you suddenly changed the channel to some semi-offensive lecture series that uses poor, dead, probably innocent men to try to make fictional TV programs appear high-minded. Later, Will McAvoy climbs on his high horse about the lack of civility in discourse, apparently oblivious to the fact that he is regurgitating an essay The Believer ran a decade ago—and one that he did not even take to heart: The season begins with McAvoy referring to the Tea Party as “the Taliban of America.” If that is civility, bring me snark. As ever, the very talented cast is almost too capable of channeling Sorkinese, ably running around like headless chickens who happen to be excellent at their jobs, even while overly obsessing about their love lives. Everyone sounds exactly the way Aaron Sorkin characters do, talking passionately and endlessly at super high speed. Even the shy people are just waiting to be prodded into having two conversations at once and delivering a verbally dexterous, personally aggrieved barn burner. The Newsroom can be exciting in small doses, but when the tone is always at a peak, the peaks just make a new floor. It’s against this backdrop of cacophonous, unending high-wire banter that Olivia Munn again walks away with the parts of the show worth walking away with. Munn, who plays the genius economist Sloan Sabbith, has an innately laid-back vibe and line deliveries that come laced with a welcome hint of Quaaludes. Her fu is more implacable even than Sorkin’s: She can’t quite be a Sorkin-bot. Her rhythm is refreshingly off. She’s a reminder that one need not—maybe even should not—sound or think exactly like a prototypical Aaron Sorkin character to appear interesting and intelligent, even if that’s exactly what The Newsroom would have you believe.